49D & lEBOHc p-p sync output. 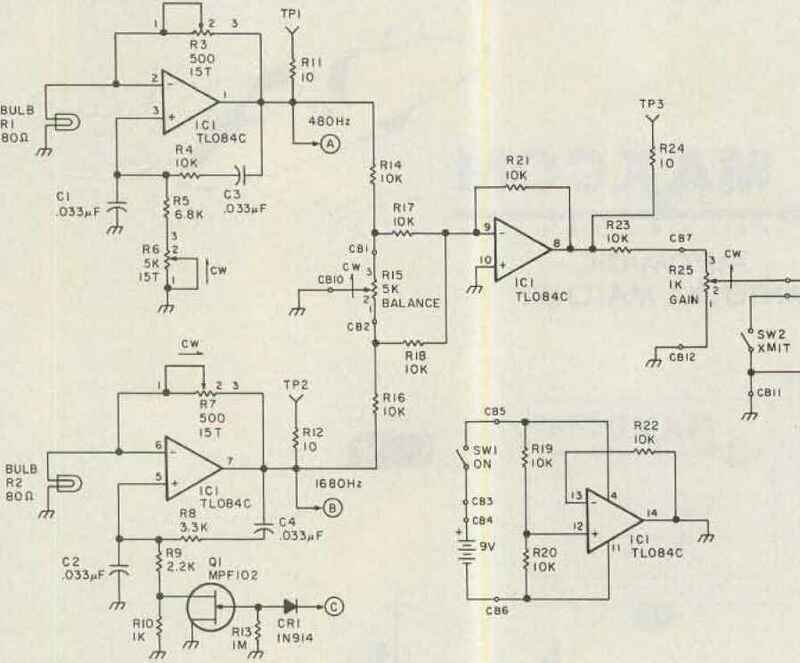 The divide-by-seven output from IC3 is applied to the vco input of the PLL, pin 3. The PLL control voltage is output on IC4 pin 13, This voltage drives network R31-R32-C7, which basically sets the dynamics of the loop R33 and C8 provide ripple filtering for the PLL control voltage, which is routed back to Q1, R34 and R35 provide a test voltage for tune-up purposes. for circuit-board layouts for my earlier 73 projects (and some coaxing from ye friendly editor), I bit the bullet this time and have done circuit-board artwork, I must admit it speeds up construction. Fig. 6 gives you the circuit-board artwork 1:1 Fig. 7 details parts placement. I used a #70 bit to drill out the IC pads and a #65 bit to drill out the rest The four mounting holes were drilled out with a 1/8-inch bit. 5/8-inch-long aluminum tubing as standoff spacers. The tubing has an inside diameter a little larger than 1/gf. Notice that I recommend high-quality 2-Watt potentiometers for the Balance and Gam controls. These pots don't creep or get noisy; they are well worth the extra money. 15-turn pots). Center the Balance control and crank the Cain control all the way up. Turn the on/off switch to On" and hook your scope to TP1. Adjust R3 for a 3-V p-p sine wave. At this amplitude there should be no apparent distortion in the sine wave, unless the battery is flat. Adjust R6 for a sine-wave period of just less than 2.1 milliseconds (480 Hz). Amplitude and frequency interact a bit so you may need to adjust R3 and R6 in sequence a couple of times. Now look at TP2 and adjust R7 for a 3-V p-p output. Using TP1 for sync, again look at TP2. You should see a sine wave "slipping" against sync. Adjust R6 carefully until the 1680Hz sine wave seen on 1P2 nearly stops. Now remove the jumper between TP4 and TP5, The 1680-Hz sine wave should lock in sync within a couple of seconds. Now touch up R3 and R6 slightly, it necessary, for 3-V p-p sine-wave amplitudes at TP1 and TP2, respectively. Both sine waves should be free of distortion. Check the waveform at TP4. It should be between -0 5 and -1.0 V dc, with little apparent ripple. Short TP4 and TPS together a coupfe of times while monitoring TP3 to ensure that the PLL readily locks. Check the Audio output jack and the Sync output jack for proper waveforms, as seen in Photo E. Turn the two-tone generator on and off several times to ensure that it stabilizes and locks up reliably. Make any adjustments needed. If you have any problems, review the schematics and the theory of operation for hints. You will need to make up an audio cable between your two-tone generator and your transceiver. Of course, there is little standardization between microphone connectors. Refer to your transceiver manual for information.